Alright, so it was decided that lightweight processes with asynchronous message passing were the approach to take for Erlang. How to make this work? Well, first of all, the operating system can't be trusted to handle the processes. Operating systems have many different ways to handle processes, and their performance varies a lot. Most if not all of them are too slow or too heavy for what is needed by standard Erlang applications. By doing this in the VM, the Erlang implementers keep control of optimization and reliability. Nowadays, Erlang's processes take about 300 words of memory each and can be created in a matter of microseconds—not something doable on major operating systems these days. To handle all these potential processes your programs could create, the VM starts one thread per core which acts as a scheduler. Each of these schedulers has a run queue, or a list of Erlang processes on which to spend a slice of time. 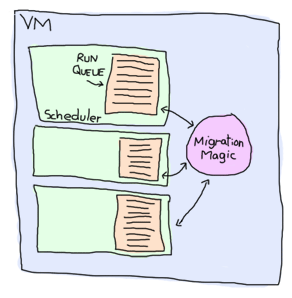 When one of the schedulers has too many tasks in its run queue, some are migrated to another one. This is to say each Erlang VM takes care of doing all the load-balancing and the programmer doesn't need to worry about it. There are some other optimizations that are done, such as limiting the rate at which messages can be sent on overloaded processes in order to regulate and distribute the load. Every once in a while, processes are migrated between schedulers according to a quite intricate process. The aim of the heuristic is to balance load over multiple schedulers so all cores get utilized fully. But the algorithm also considers if there is enough work to warrant starting up new schedulers. If not, it is better to keep the scheduler turned off as this means the thread has nothing to do. And in turn this means the core can enter power save mode and get turned off. Yes, Erlang conserves power if possible. Schedulers can also work-steal if they are out of work. For the details of this, see . IMPORTANT: In R15, schedulers are started and stopped in a "lagged" fashion. What this means is that Erlang/OTP recognizes that starting a scheduler or stopping one is rather expensive so it only does this if really needed. Suppose there is no work for a scheduler. Rather than immediately taking it to sleep, it will spin for a little while in the hope that work arrives soon. If work arrives, it can be handled immediately with low latency. On the other hand, this means you cannot use tools like top(1) or the OS kernel to measure how efficient your system is executing. You must use the internal calls in the Erlang system. Many people were incorrectly assuming that R15 was worse than R14 for exactly this reason. Measurements from a real telecom product showed a 1.7 speed improvement between a single and a dual core system. The SMP VM with only one scheduler is slightly slower (10%) than the non SMP VM. This is because the SMP VM need to use locks for all shared datastructures. But as long as there are no lock-conflicts the overhead caused by locking is not that high (it is the lock conflicts that takes time). This explains why it in some cases can be more efficient to run several SMP VM's with one scheduler each instead on one SMP VM with several schedulers. Of course the running of several VM's require that the application can run in many parallel tasks which has no or very little communication with each other. To gain performance by using the SMP emulator, your application must have more than one runnable Erlang process most of the time. Otherwise, the Erlang emulator can still only run one Erlang process at the time, but you must still pay the overhead for locking. Although we try to reduce the locking overhead as much as possible, it will never become exactly zero. Sets the amount of scheduler threads to create and scheduler threads to set online when SMP support has been enabled. Valid range for both values are 1-1024. If the Erlang runtime system is able to determine the amount of logical processors configured and logical processors available, Schedulers will default to logical processors configured, and SchedulersOnline will default to logical processors available; otherwise, the default values will be 1. Schedulers may be omitted if :SchedulerOnline is not and vice versa. 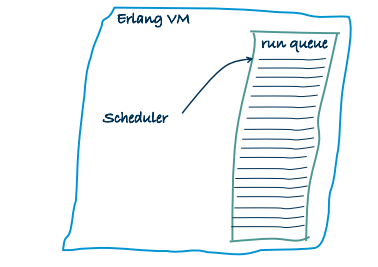 The amount of schedulers online can be changed at run time via erlang:system_flag(schedulers_online, SchedulersOnline). Note: the results are similar whether symmetric multiprocessing is enabled or not. To prove it, you can just test it out by starting the Erlang VM with $ erl -smp disable. To see if your Erlang VM runs with or without SMP support in the first place, start a new VM without any options and look for the first line output. If you can spot the text [smp:2:2] [rq:2], it means you're running with SMP enabled, and that you have 2 run queues (rq, or schedulers) running on two cores. If you only see [rq:1], it means you're running with SMP disabled. If you wanted to know, [smp:2:2] means there are two cores available, with two schedulers. [rq:2] means there are two run queues active. 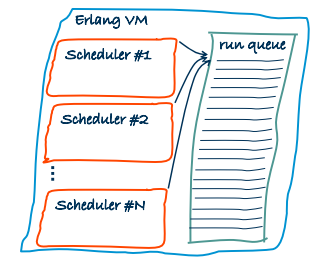 In earlier versions of Erlang, you could have multiple schedulers, but with only one shared run queue. Since R13B, there is one run queue per scheduler by default; this allows for better parallelism. -smp enable and -smp starts the Erlang runtime system with SMP support enabled. This may fail if no runtime system with SMP support is available. -smp auto starts the Erlang runtime system with SMP support enabled if it is available and more than one logical processor are detected. -smp disable starts a runtime system without SMP support. By default -smp auto will be used unless a conflicting parameter has been passed, then -smp disable will be used. Currently only the -hybrid parameter conflicts with -smp auto. Parallelism is not the answer to every problem. In some cases, going parallel will even slow down your application. This can happen whenever your program is 100% sequential, but still uses multiple processes. One of the best examples of this is the ring benchmark. A ring benchmark is a test where many thousands of processes will pass a piece of data to one after the other in a circular manner. Think of it as a game of telephone if you want. In this benchmark, only one process at a time does something useful, but the Erlang VM still spends time distributing the load accross cores and giving every process its share of time. This plays against many common hardware optimizations and makes the VM spend time doing useless stuff. This often makes purely sequential applications run much slower on many cores than on a single one. In this case, disabling symmetric multiprocessing ($ erl -smp disable) might be a good idea.